Located 10 south-west of Alford, Kildrummy sits on top a ridge dominating the route from Don to Moray. It is Scotland's most complete 13th-century castle. On the site of earlier dwellings, this castle is thought to have been started in the 1230s by the Bishop of Caithness, Gilbert de Moray, for Alexander II. It was possibly based on the French Chateau de Coucy near Laon but there were lots of additions and extensions over the years including a chapel thought to have been built around the time of Alexander's sudden death in 1249. The gatehouse is very similar to castles in Wales by Edward I and it may have been added on his orders in 1296 when he captured it from the Scots. Lots of history took place here and it was occupied many times by both the English and Scots. 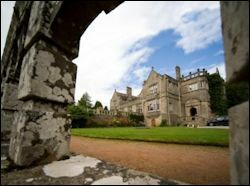 'Bobbing John', the 11th Earl, used Kildrummy as the headquarters to organise the final details of the 1715 Jacobite Rising. After this failed, the castle was dismantled one last time. Later it was used as a quarry. Only in 1898 were repairs and excavations undertaken by Colonel Ogston, owner of the estate. It is now in the care of Historic Environment Scotland and is open daily April to October. Admission charge. Be sure to visit the magnificent gardens started in the early part of the 20th century and also the huge bridge over the water. 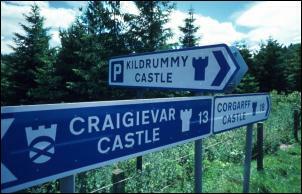 KILDRUMMY CASTLE HOTEL offers 4 star accommodation in gardens and woodland near the ruins of old Kildrummy Castle. This Victorian mansion house has an elegant restaurant, lounge bar, antiques, and many original features such as wall tapestries, oak panelling, hand carved staircase, etc. Choice of 16 ensuite bedrooms (all with TV, telephone, hairdryer, etc.). Friendly staff and good food.